Edible flowers aren't a new phenomenon, but garnishes of fresh flowers tend to intimidate diners. No one is really sure if the flowers are there for decoration or to be eaten. Even if they are to be eaten, diners often wonder if they will taste good, or like parsley, be better left on the plate. There are several edible flower blossoms that can be enjoyed both fresh and cooked. 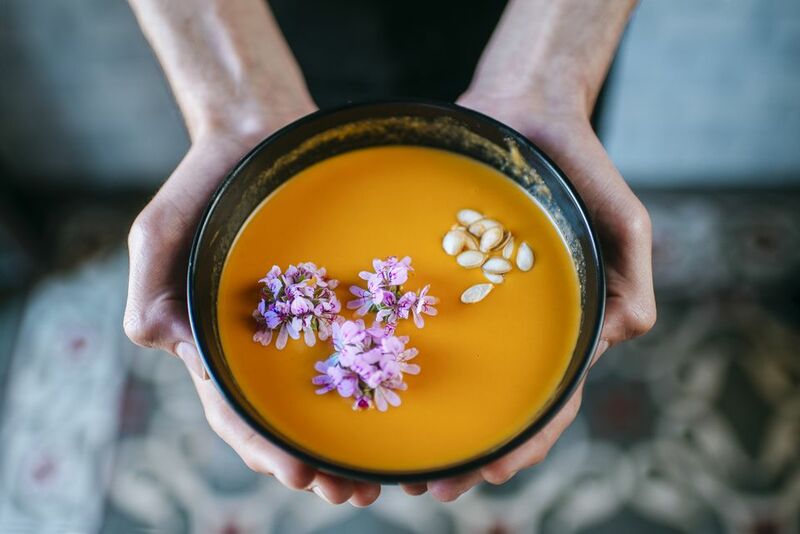 It's becoming more common to find edible flowers for purchase in the grocery store, but it's so easy to grow your own and since flowers are best when eaten soon after harvest, growing your own edible flowers makes even more sense. Growing flowers to eat is really no different from growing flowers to feast on with your eyes. However there are a few precaution you will want to take, as well as a few tricks to ensure you get the most flavor and beauty from the flowers you grow for your plate. Here are some tips. Only eat flowers when you are absolutely certain they are edible. Just because a flower is used as a garnish, doesn't mean it's edible. Never eat a flower that has been treated with a pesticide that was not labeled for use on food products. Always follow the pesticide label instructions for harvesting. Never eat flowers from florists, nurseries or roadsides. For most flowers listed as being edible, they are referring to the petals only. Remove the pistils and stamens before eating as well as any attached sepals. Edible flowers are more pleasant to eat if you add the petals to dishes, rather than tossing in a whole flower. Don't add edible flowers while you are cooking. Leave them to the last minute, so they retain their texture and color. This includes adding them to salad. Sprinkle them on top of the salad, after it has been tossed. Expect the flavor of edible flowers to vary seasonally and with growing conditions. Edible flowers should ideally be harvested in the cool, morning hours, when they are still full of water. If you are not going to be using the flowers immediately, cut them with the stems intact and keep them in water. You could also store them in damp paper towels, in the refrigerator. Borage: Borage has a cucumber-like scent and flavor. The vivid blue flowers make a striking addition to a salad or a last minute garnish to cooked foods. Calendula: (Pot Marigolds) The petals work well in cooked and fresh dishes. Calendula is also used as a saffron substitute. The yellow or orange petals will color and flavor foods when chopped and sautéed. Dandelion: Everyone is familiar with dandelion wine, but the flowers are also edible and quite delicious when young and tender. There are many cultivated varieties that have been developed for less bitter flavor and more controlled growth, but even the so called weeds in your lawn can be eaten, provided you haven't used pesticides on them. Daylily: Most people are surprised to hear that Daylily flowers are edible, however they are often stuffed and prepared like squash blossoms. Gem Marigolds (Tagetes tenuifolia): 'Lemon Gem' and 'Tangerine Gem' Marigolds are the only edible marigolds. As their names suggest, they have a citrus flavor, even though you won't smell a citrus scent. Pull off the petals and break off and remove the bitter portion that comes to a right angle. Herb Flowers: (Anise Hyssop, Basil, Bee Balm, Chives, Cilantro, Dill, Fennel, Garlic...) Many herb flowers are just as tasty as the foliage and more attractive. Add some petals to any dish you were already going to flavor with the herb. Nasturtium: Easy to grow. Flowers have a peppery tang to them. The bright colors make great accents in salads. Can also be used to infuse vinegar. or even vodka. Pansy: The whole flower is edible, sepals and all. Pansies have a mild, minty flavor. The flowers work well for candying and make great decorations on top of hor d'oeuvres and cakes. Squash Blossoms: All squash flowers are edible, not just zucchini. A popular way of preparing them is to stuff the blossoms with cheese and fry them.